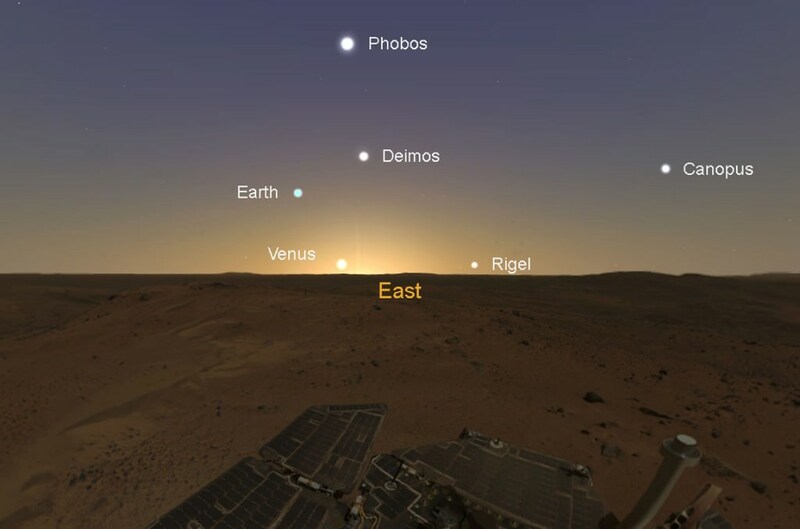 I thought it was well established now that on Mars the sunsets and sunrises have (fairly dark) blue skies and daytime (or soltime) has reddish skies - the reverse of colours on Earth. No, this is what we see at sunrise. 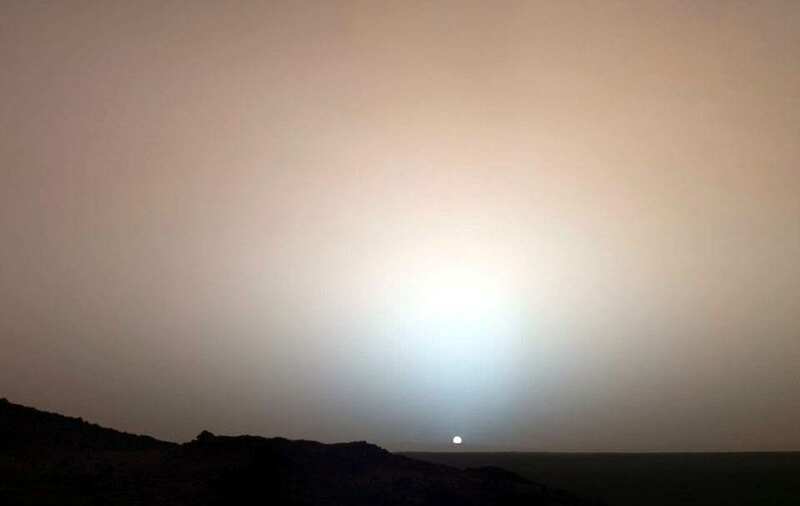 And this is what we supposedly see at sunset? Even my images show sunrises and sunsets are similar. And a true color image from NASA. We can go on about color charts, looking at this at the wrong angle, and so forth, but the evidence is a dogs breakfast, and NASA intentionally lying is the only plausible answer. I won't even mention the 20 years of images from Cur, and Spirit, (combined) showing ONLY red sky images, (a handful are red, blue) regardless of elevation or anything else, (the image above was a rare fluke). Considering how much NASA is lying about UFO's, can we really be that surprised that they are BS us about an earthlike planet in our own neighborhood? I follow the trail of evidence and believe it what that says, not do otherwise. 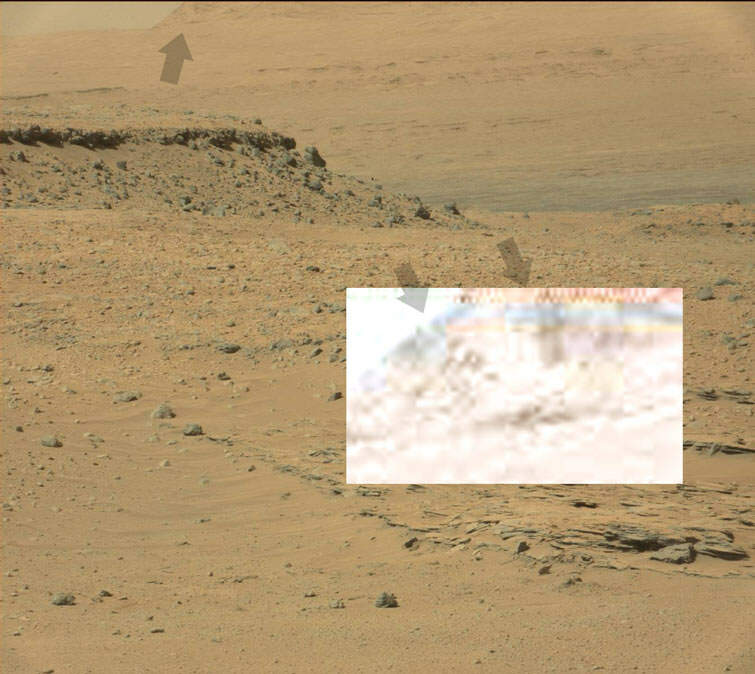 Ok, first image is Curiosity's reflection, (dark foreground and white thing, top, right). But there is also green in the background. 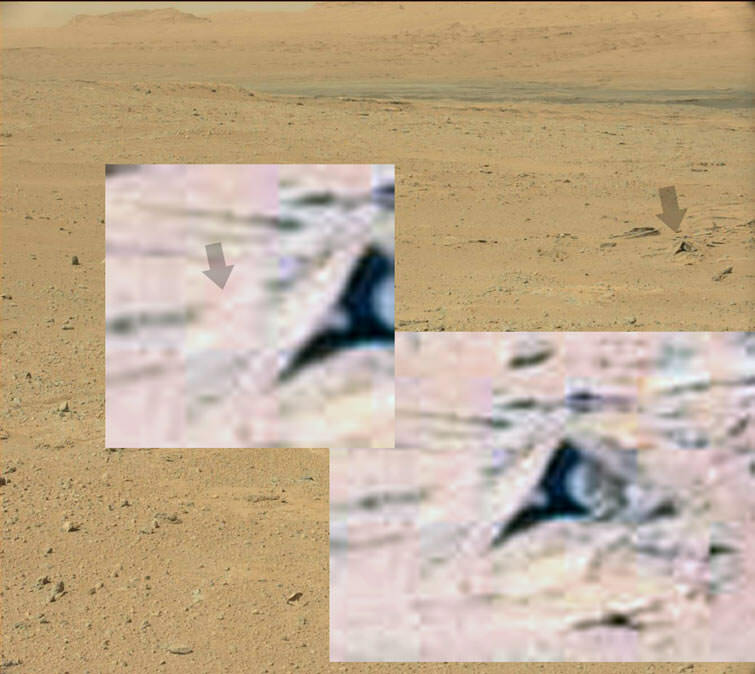 Second enlarged image seems to be a distant pyramid. 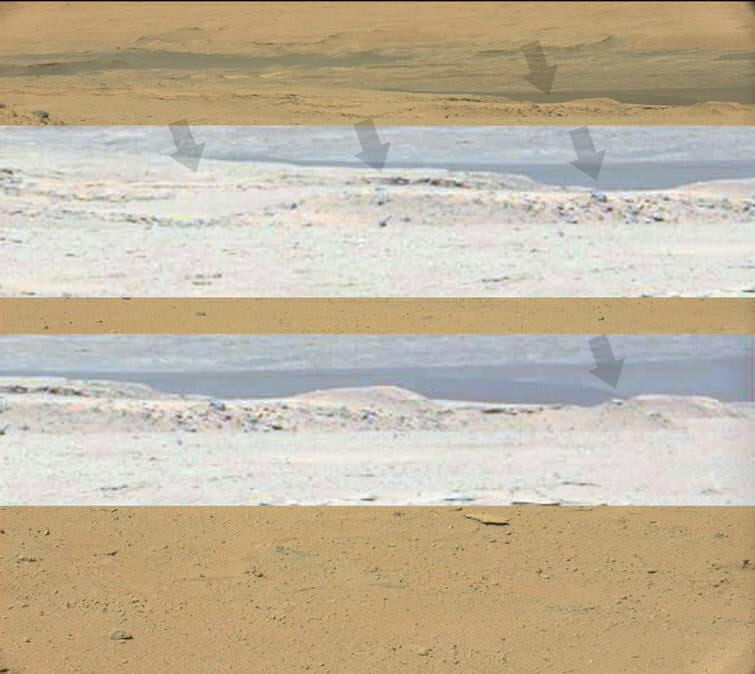 Top image seems to be showing Curiosity in the middle, and dust being blown off the left while it is moving. 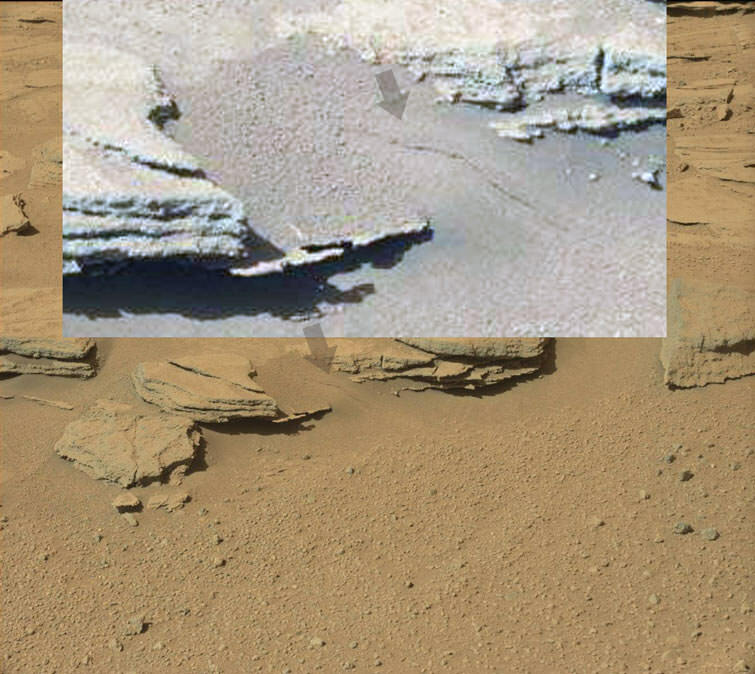 Bottom image, more water flowing down a hill, the arrow shows the rock being reflected back in the water. 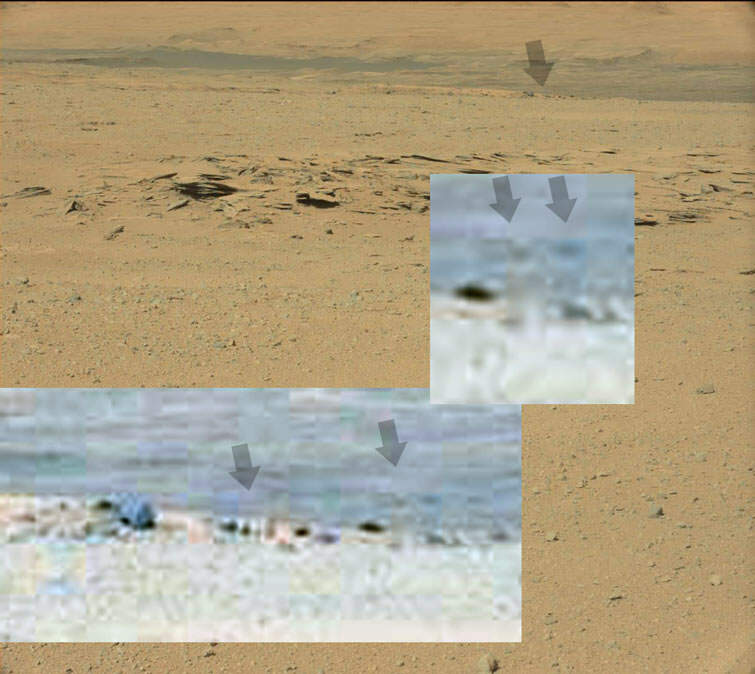 So Curiosity drives past rivers on Mars, but that is ok, no interest to NASA. Top image shows a blue sky and white sun, (same as us). 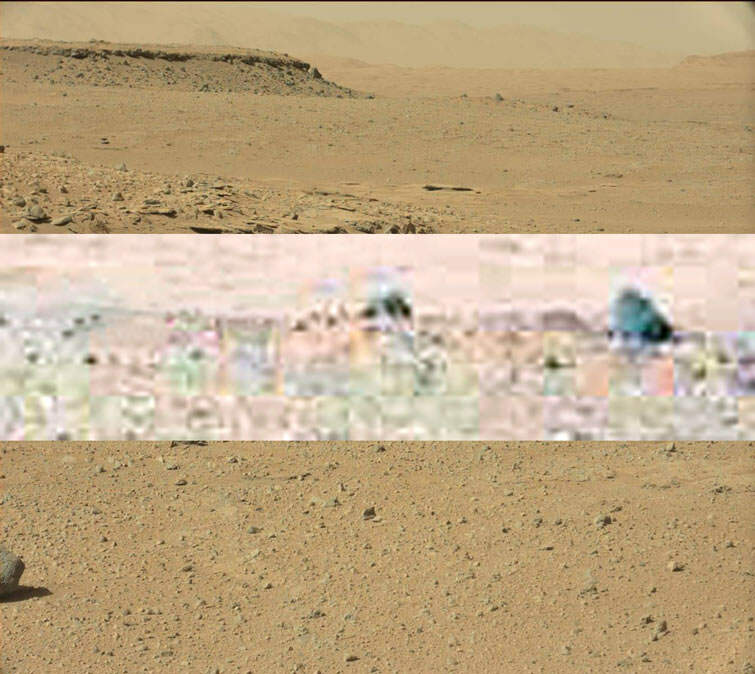 Bottom left, is Curiosity's underside and its wheels, (well, two of them) and some blue hills and more green stuff, (probably some swamp gas). the black and white square pattern is not part of Curiosity, (l looked at plenty of its underside images and the rover) so we have a uniform pattern of squares on Mars that NASA is intentionally burying, and proves yet again, that Mars has intelligent life, (or had). But alien artifacts don't interest NASA. 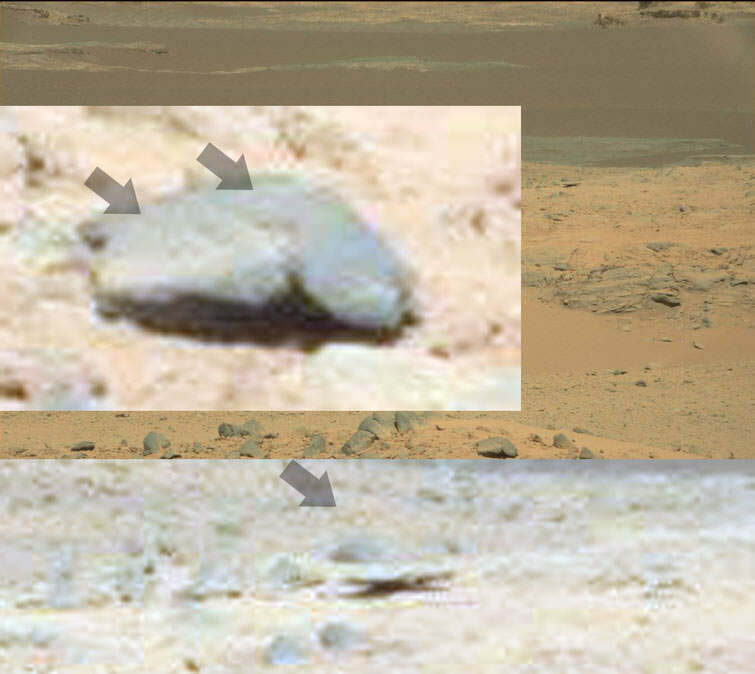 Yes, whenever NASA is questioned about taking a closer look at a rock that looks like a statue, they always say that it isn't and we won't b other. 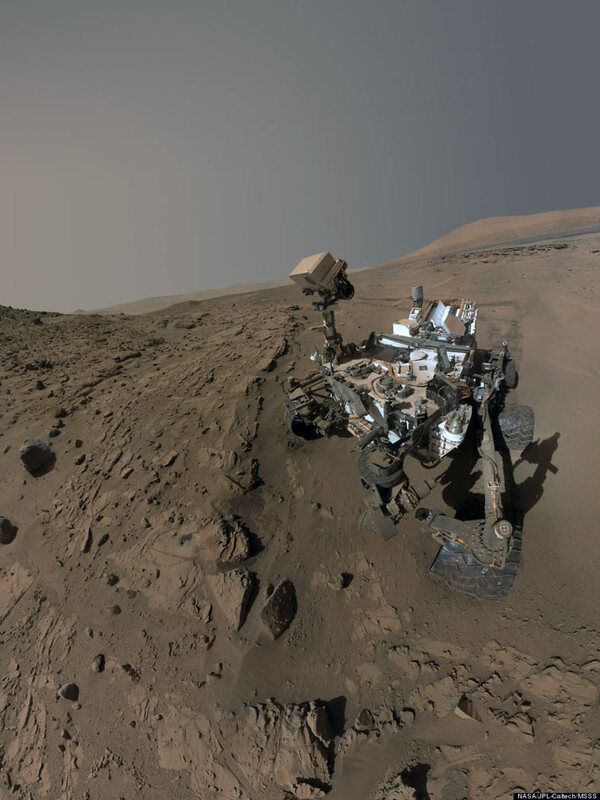 How can they be so sure, even NASA has said that Mars was Earth like about a million years ago. And water, which even they said exists as liquid on the surface, doesn't interest them. If they go and take a closer look at some of the flowing water l keep finding, then we might start sussing out that the air pressure, isn't at 30,000 feet Earth Levels, but similar to Earth at ground level. And even worse they will probably find something swimming about. Million? I think you probably mean billion or even billions don't you? That said, I am strongly of the view that if there was life there then, it still is, and there is no reason why it won't have continued evolving in its niche locations (hot springs, periodical melt locations, volcanic vents, underground pools etc). True NASA says half a billion years ago, but NASA and lying are mutually exclusive. No, since all evidence points to Mars being Earthlike, l am off the opinion that it has been for a long time, (billions of years) but a natural disaster destroying its atmosphere, a million or less years ago also occurred. That may explain all of the glassy rocks we keep seeing, and the occasional artificial object, (ancient civilization wiped out). Mars is in our habitable zone, and Hubble keeps showing green bands, lake systems up top and a blue atmosphere thicker than our own. I know that B - Grade sci fi movies and H.G. Wells didn't help, but like any good scientist l go with the evidence. Even though it is a major paradigm shift and scary for us, but l havn't found one alien checking out the rover and blowing it up, etc. Image down the bottom is another puddle, within easy reach of Curiosity, and this is a shallow puddle most likely over a rock, and most likely not salty as hell, but just muddy. 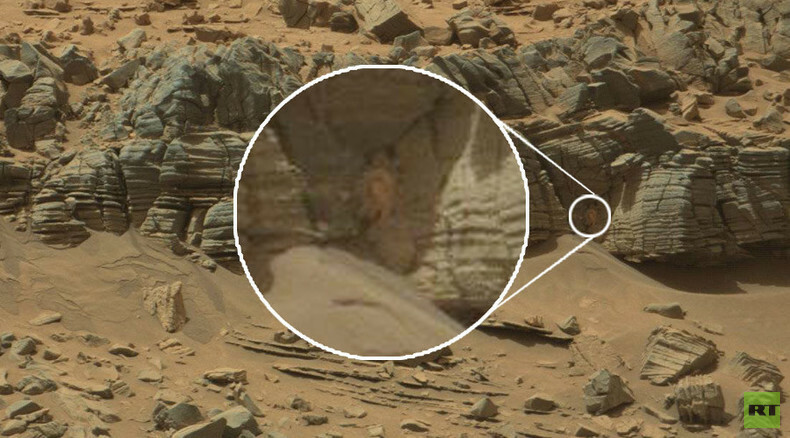 Probably explains why the rover never checks these out, all they have to do is stick a probe in it, and their cover is blown. And top images show this artificial structure on the hill. 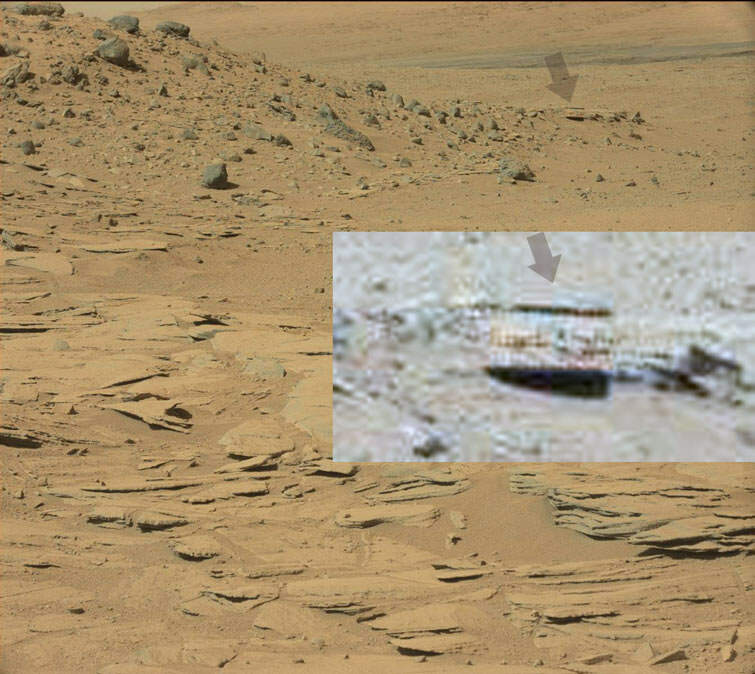 This Cannot be the rovers reflection as this hill is a good 5 to 7 km's away at least, and if it is it means image tampering. 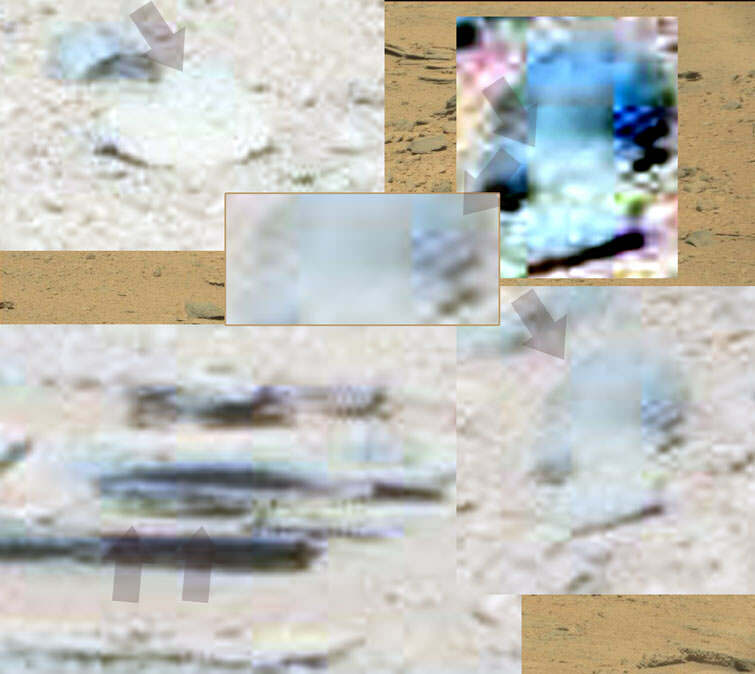 Blew it up, and NASA has of course blurred part of it, but there is still enough left. 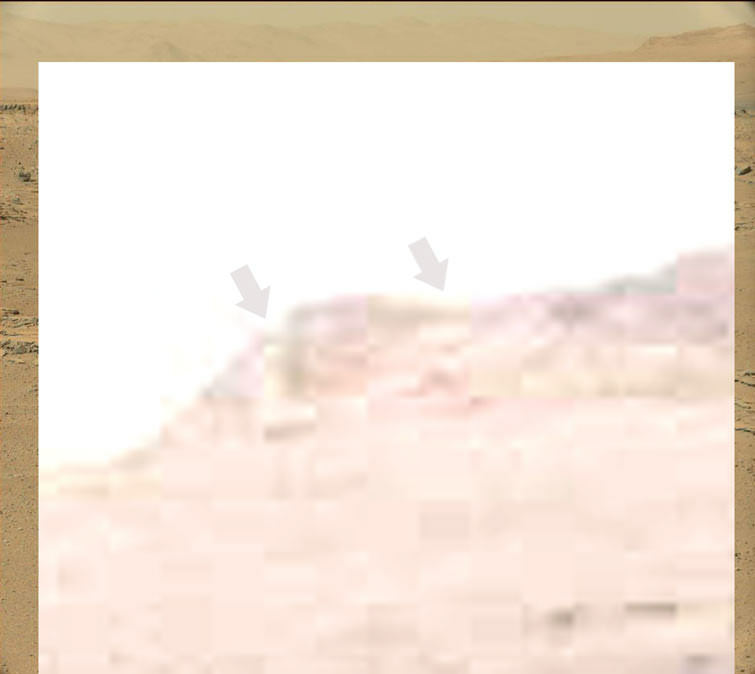 The structure on the right, is l believe a building with a large door at the base, and probably a viewing platform up top. The thing they blurred is an animals face, probably with similar features, (obviously a good view from up there). Beats me what the L is, with NASA's constant fiddling. 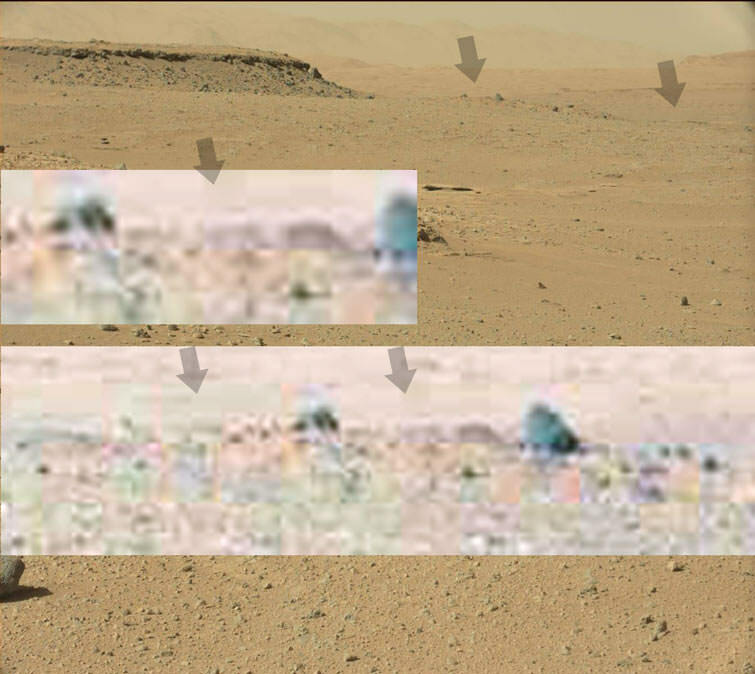 With good evidence like this showing ancient or more likely current structures on distant hills, it amazes me that some only believe in what NASA keeps telling them. 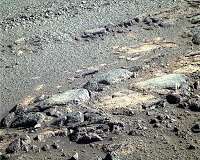 Opportunity is continuing the exploration of "Perseverance Valley" on the west rim of Endeavour Crater. The rover is positioned about halfway down the approximately 656 feet (200-meter) valley near an apparent flow stream island. I know probably not a Martian freeway, but geeze it sure looks like one. 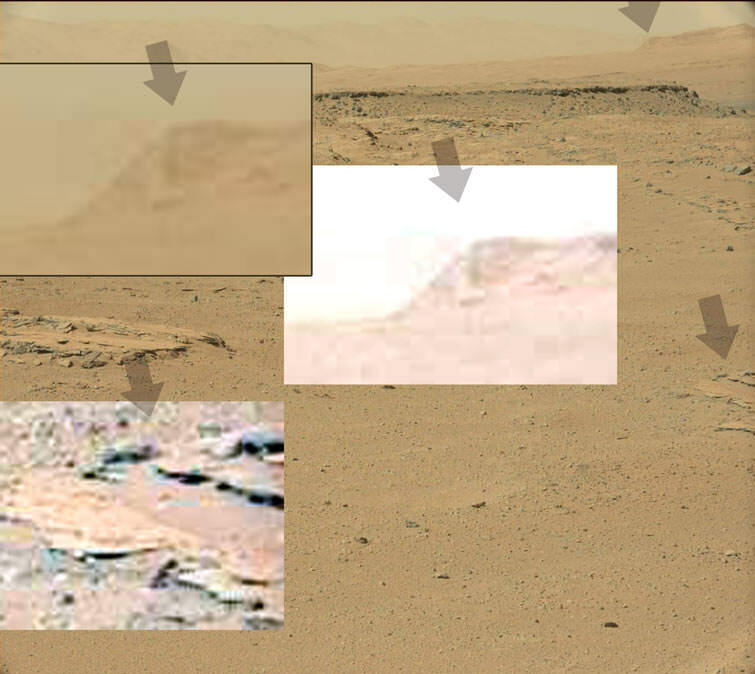 Love to say that this is a solar collecting station on Mars, but whether it is, it doesn't look natural. 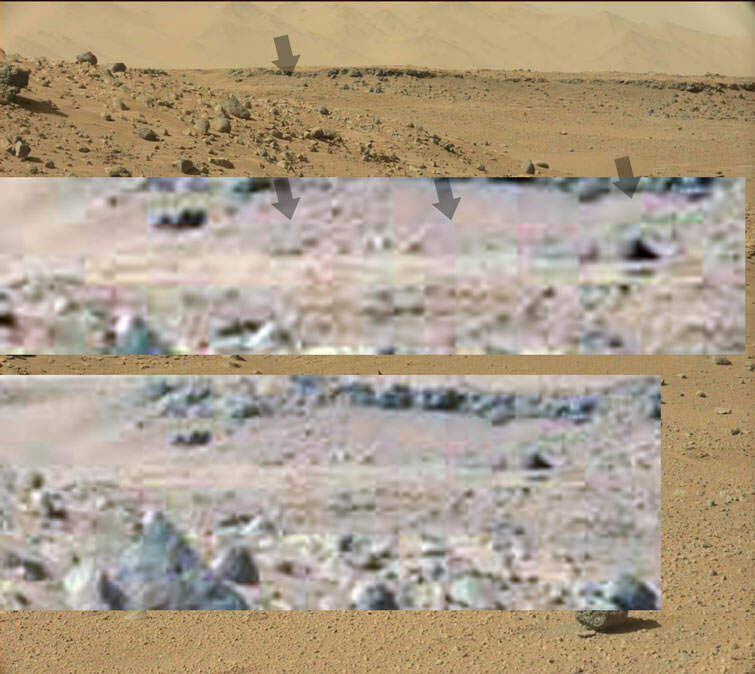 And this is the structure that NASA originally blurred from the previous one, which l thought was an animal head depiction on the hill. Seems that l was wrong and it is a castle of some kind, (no wonder they originally blurred it) and the drawing on the left is a very simplistic depiction of Curiosity. Yes, all aliens are evil, lol. More signs of water flows. And l am sure that if l created a silly Youtube video l would say that this is a head depiction of an Owl? It isn't, (Curiosity's turrent shadow, reflection). I would have loved to have said that this was a swamp, but it is a series or waterways with sand separating them, (obviously an almost dried up river, and the reflection of the rock on the right gives this away). Seems to be some dust on the left. 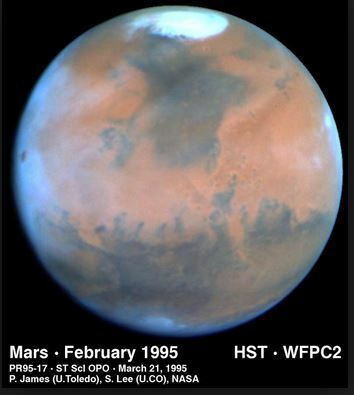 Evidence like this add's to Mars air pressure being more like ours, since it is pretty hard to have vast waterways, etc that are always very salty, and also add's to Mars having rainful, (although it appears to be in a drougtht at the moment). 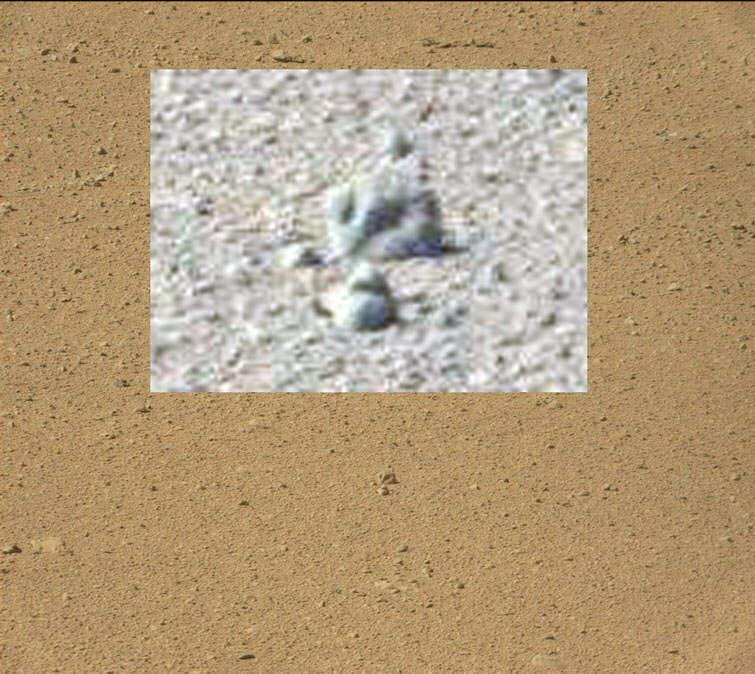 Ok, hit the jackpot today, NASA staff scouring through these images obviously got slack today, (that or someone was leaving anyway and threw us a bone)? Probably the other reason why my view count is up to almost 15k, is just in case l do find something significant, people keep coming back, but either way thanks, and enough of this, let's get on with it. But we will start off small. 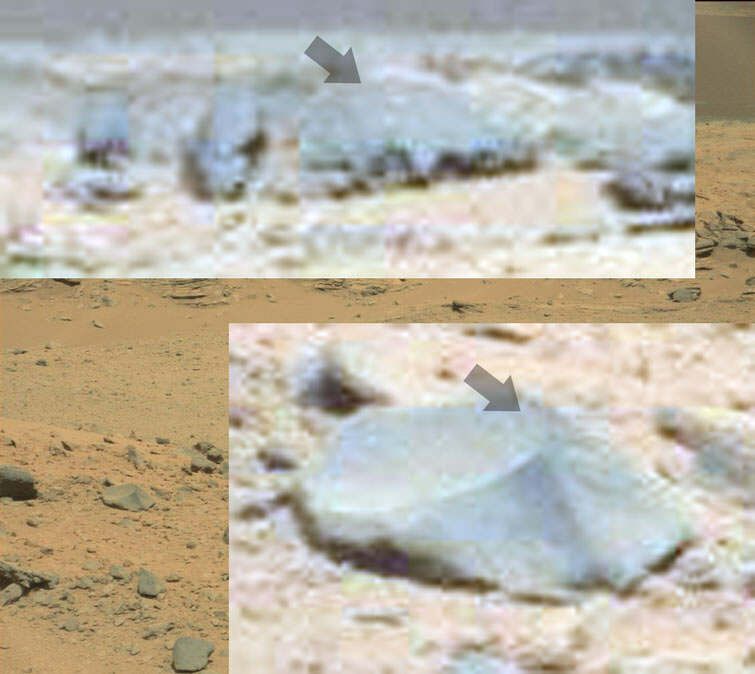 Ok, first image shows a reflective cylinder under this, shiny flat rock. This could be natural, but l am learning more towards it being artificial, (last image is pretty good). 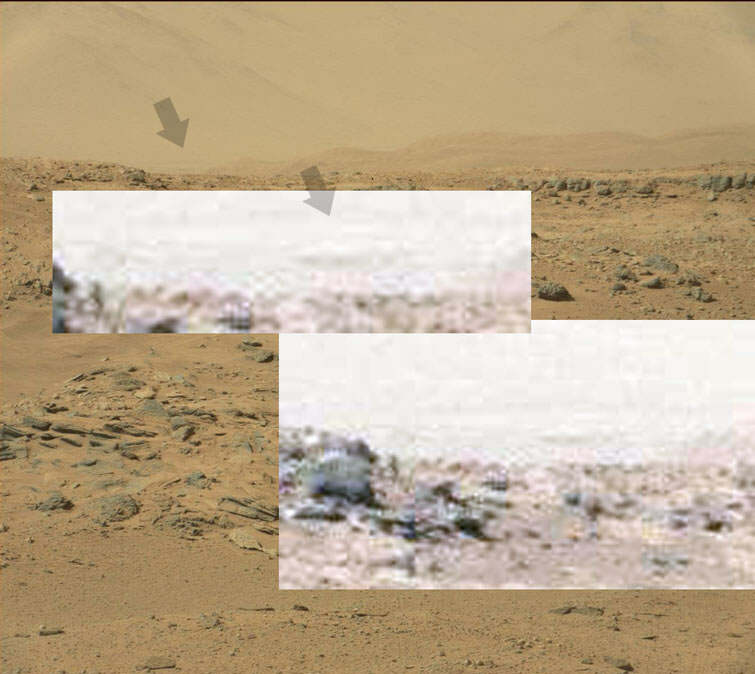 This one is a puzzle, but none of it is the rovers reflection. Best guess that it is a bridge with two giant statues at one end, (maybe both). And now we get to the one l am stocked about. I have said for some time that Mars has roads and freeways, and bridges, and probably sounded like an idiot in the process, (ahead of my time, sounds better thought). 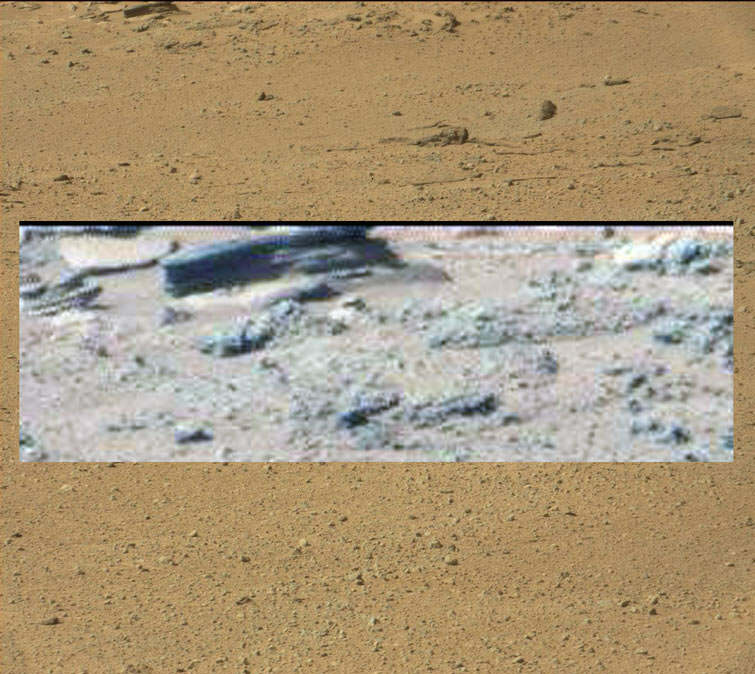 This is not Curiosity's reflection as it is too far away and looks nothing like it. And is obviously a giant bridge spanning this impression between these two hills or a bridge or more likely a giant dam wall. This flat ground goes all the way to the edge of this image, or most likely a freeway. And it is most likely a giant bridge, since it is leaving a shadow on part of the hill on the right, and the two middle ones are hollow. It is white and made of advance materials. There are also blimp like things on top of this, that l have seen on other road type structures on Mars in the past, or cars for want of a better word. NASA unfortunately messed up the bridge continuing on the left, but some of it is still visible, (or enough to show that Mars is inhabited now, and has an advanced civilization on its surface as we speak). So not so crazy after all. The last post Timcom photo's in image 1,2 a dark streak that is a hemetite or blueberry field of iron where water once stayed for a long period of time. Ok, l tried to get this to the original image, which is a freeway curving around this mountain side. Not saying I agree with his analysis but lots of the images do need further investigation. Certainly if l am seeing freeways, (which is likely) then it should be easy to see in a satellite image, or at least see some of it, (NASA's cutting and pasting). Beats me what this is, looks like a mirror, and from what l can see in the background it is probably there for a reason. More obvious signs of water flows, which means that the soil the rover is moving over is wet or damp, (and that explains why some of it is clinging onto the rover wheels. Could be an animal trail of course. Well this definitely looks like a snake...even if it isn't! There appears to be at least 2 or 3 other apparent items to enlargen in the image. Phew, impressive Louis, but without running it through Photoshops filters, etc, l would say that it is not a snake, ancient harp perhaps, but snake nope. Also interesting that it is behind a rock, like someone put it there. Yes, SpaceNut l have seen some of those, or should l say, simple rock paintings, or more likely colored chalk depictions using the same color in the past, so l wouldn't say that it is a plant, but a subtle hint that the rovers path is spotted with artwork. If l am right about Mars, then the rovers path will be a showcase of intelligent life and friendly inhabitants. Stark contrast to NASA's constant square peg in round hole evidence of nothing and nobody.